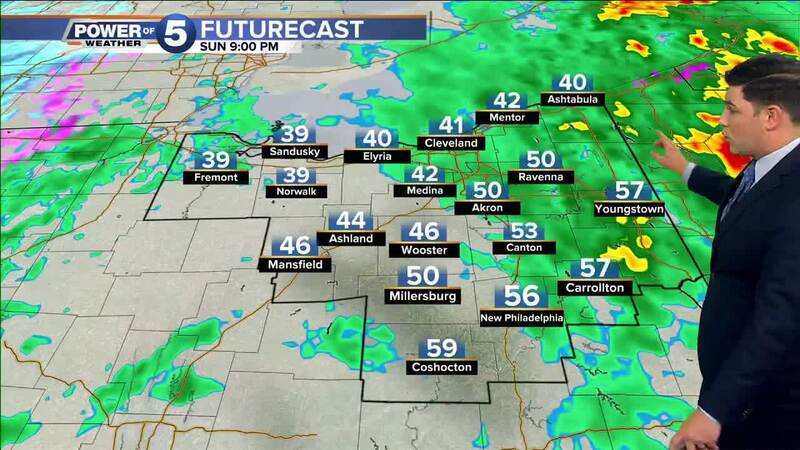 CLEVELAND — Severe storms will make their way across Northeast Ohio on Sunday. Surface low pressure is expected to move between Cleveland and Akron by 8 p.m. Sunday. That low pressure will drag warmer air and a cold front into the area. With those conditions, a line of strong to severe thunderstorms is expected to form along the front and move eastward throughout the area. The strong to severe thunderstorms are expected to peak between 4 p.m. and 8 p.m., bringing strong winds and possible hail. Some areas may be at risk for an isolated tornado or two.